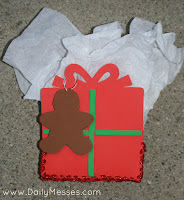 I saw some really cute felt gift bags and gift tags at the store the other day and I thought they would be pretty simple (and cheaper) to make. I used foam cut outs, thin ribbon and red/white packaging twine. DM Tip: Baker's twine would work well too. 1. Measure and cut out the bottom and sides out of a foam craft sheet. 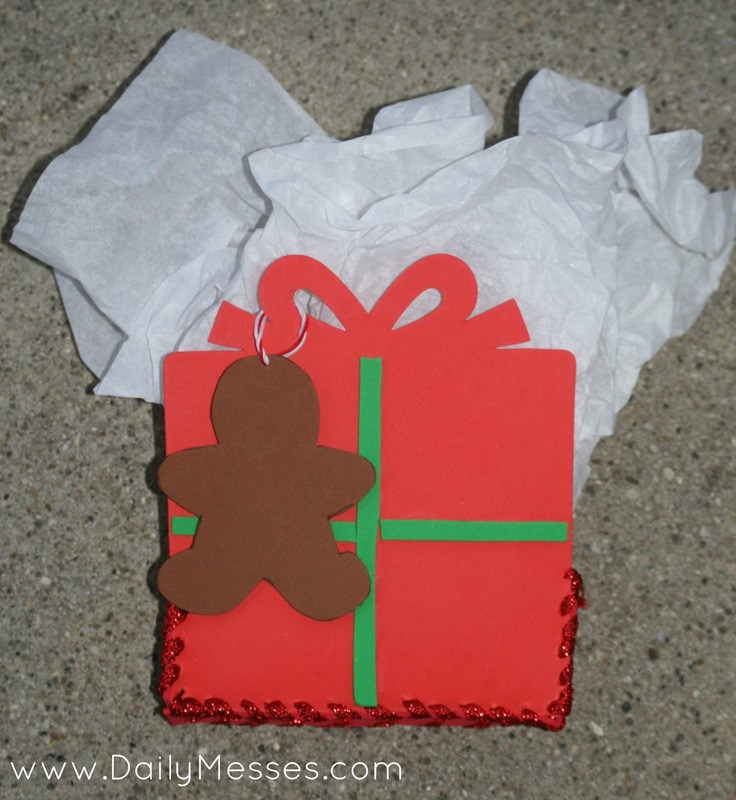 DM Tip: I bought pre-cut gift box and gingerbread men shaped foam sheets, but you could also cut out your own shapes. 2. Thread a thick needle with ribbon/twine. Sew the bottom and sides to the shaped sheets. 3. Optional: Decorate. I placed on thin strips of a foam craft sheet to make the ribbon on the present. 4. Place gift card or small gift and tissue paper in the bag. DM Alternative 1: To make it easier, don't cut out shapes for the sides and bottom. Simply line up the edges and sew together. DM Alternative 2: For younger kids: Use a hole punch and punch holes around the edges. Let them thread the ribbon through the holes. 1. Trace out your favorite cookie cutters onto a foam craft sheet and cut out. 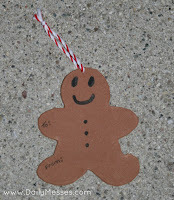 I chose a gingerbread man. 2. Thread a thick needle with baker's twine and thread through the top of the cut out. 3. 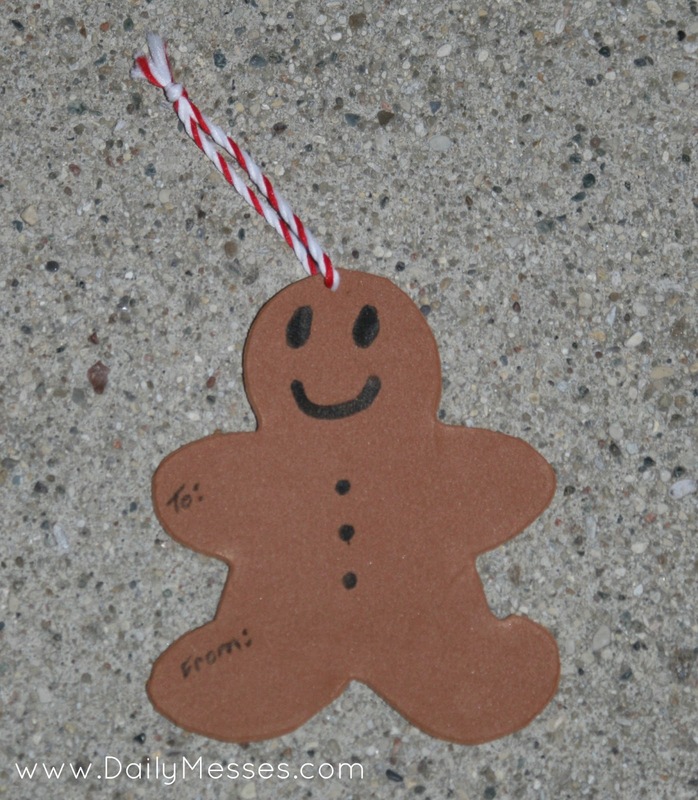 Decorate, draw on face, To: , and From: . Amazing gift bags! Really like along with combo! I would like yo see more House developing tasks please!